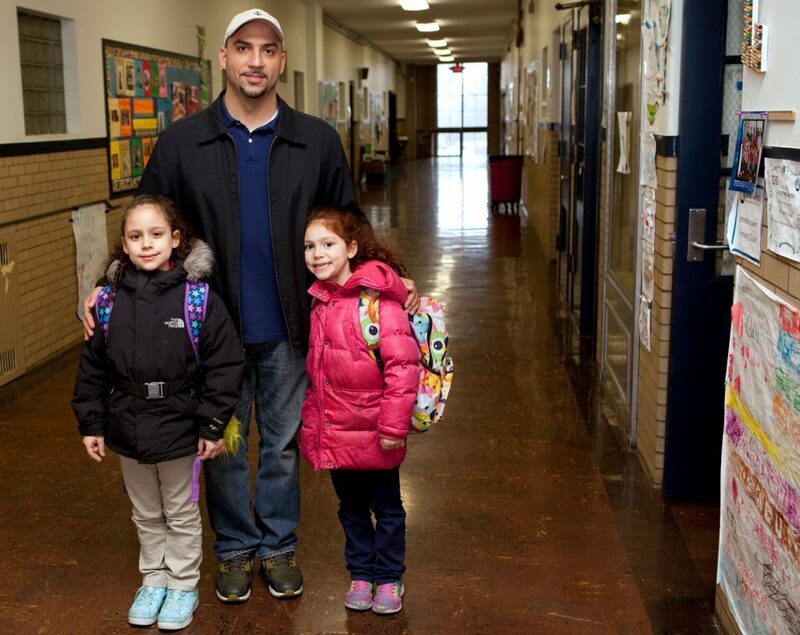 Eloy Gonzalez, center, with his daughters Arielle and Elli, at Near West Intergenerational School. This story is part of an ongoing series about how families chose their schools. 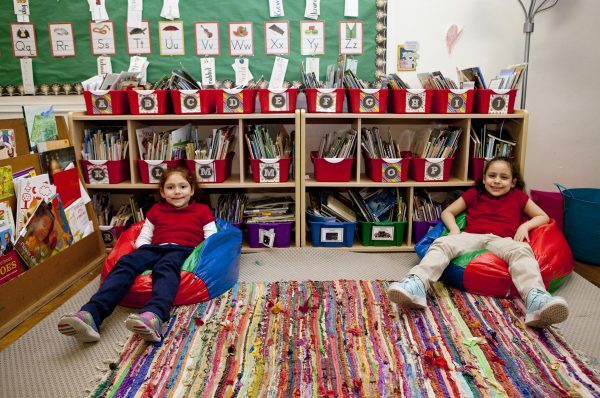 More than 170 public schools, both district and charter, are available to choose from at no additional cost for families living within the Cleveland Metropolitan School District (CMSD). “I think a lot of people are still unaware that they can look around for a place that’s right for their kid, but it’s so important to do it,” says Eloy Gonzalez, a father of five who sends his children to a school in Ohio City, even though the family lives in Tremont. Empowering parents to choose where to send their children to school is part of the bedrock of Cleveland’s Plan for Transforming Schools, the comprehensive reform strategy to ensure every child in Cleveland attends a quality school. A decade ago, when Eloy Gonzalez was considering where to send his first daughter to school, he didn’t see any options he liked. “It was important to us that she have a positive, safe experience at school — and we just weren’t sure we’d get that in any of the options around us,” he says. As a professionally fulfilled but far-from-wealthy youth ministry director at a Tremont church, he didn’t feel he was in a financial position to choose a private or parochial school. Nor did he want to sell his house and move to the suburbs. Tremont was home — not only to him, but also his closest family and friends. Gonzalez and his wife decided to homeschool their daughter and — later — her younger sister. They joined a homeschooling cooperative focused on preparing students for college and worked together to provide daily lessons for their daughters. The arrangement was time-consuming and demanding, but the Gonzalezes took comfort in the feeling that they were providing the best possible education for their children. Then, after a gap of about 10 years, they had a third child. Then a fourth. And a fifth. The thought of simultaneously homeschooling five kids exhausted them — and presented logistical challenges they weren’t sure they would overcome. How could they keep a high schooler challenged at the same time they were teaching a toddler the ABC’s? Fortunately, by the time they were ready to consider options for their younger kids, they were surprised to find the education landscape around them had changed significantly. This was in 2012, when a school levy had recently passed that, among other things, enabled the adoption of the Cleveland Plan. The Gonzalezes started asking friends and acquaintances about school options. One friend, a teacher, recommended they consider the school where she worked: Near West Intergenerational School, a charter school that opened in 2011. She raved about the school’s organizational approach, which clusters students from three grade levels in one classroom. This allows students to advance at their own pace, with older students helping teach younger peers. They were unsure they would be allowed to send their kids to the school since it’s in Ohio City rather than Tremont. But their friend reassured them. Gonzalez and his wife visited and fell in love. “The atmosphere was so positive; the classrooms felt orderly,” he says. He also liked that the student body, of about 240 kids, felt representative of the city as a whole: about half African American, one-third white, and the remainder Latino or mixed race. Today, all three of their younger children attend Near West Intergenerational, and the Gonzalezes are thrilled with what they’re experiencing. Each child learned sight words and basic math as young as kindergarten. Even better, the father of five says, they’re learning to approach others with a positive, constructive attitude, modeled by teachers. He’s even adopted a similar approach in his own work as a youth minister.